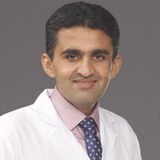 Dr. Vijey Kumar obtained his MBBS from Sindh Medical College Karachi in year 2005. He has more than 9 years of experience as Medical Practitioner. He worked in Central Health Establishments in Pakistan as Medical Officer and in Al Noor Hospital Abu Dhabi for two years as Medical Practitioner. Dr. Vijey is ECFMG certified with USMLE step-3. Dr. Vijey is interested in the fields Gastroenterology and Rheumatology. Dr. Vijey can converse with his patients in English, Hindi, Urdu and Sindhi.